علمدار, کمال, گلابی, مصطفی. (777). تعادل در تخمین مرز توده‌ها و ساختارهای خطی بی‌هنجاری‌های میدان پتانسیل. مجله ژئوفیزیک ایران, 10(1), 47-60. کمال علمدار; مصطفی گلابی. "تعادل در تخمین مرز توده‌ها و ساختارهای خطی بی‌هنجاری‌های میدان پتانسیل". مجله ژئوفیزیک ایران, 10, 1, 777, 47-60. علمدار, کمال, گلابی, مصطفی. (777). 'تعادل در تخمین مرز توده‌ها و ساختارهای خطی بی‌هنجاری‌های میدان پتانسیل', مجله ژئوفیزیک ایران, 10(1), pp. 47-60. علمدار, کمال, گلابی, مصطفی. تعادل در تخمین مرز توده‌ها و ساختارهای خطی بی‌هنجاری‌های میدان پتانسیل. 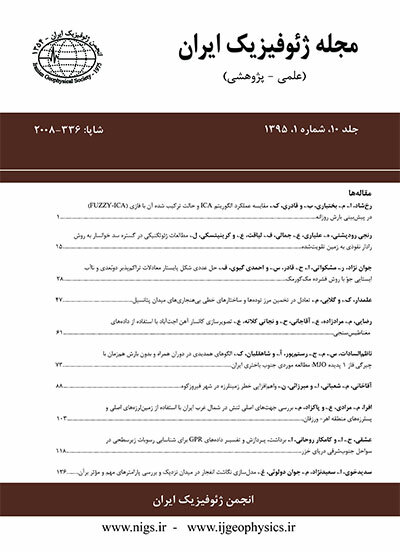 مجله ژئوفیزیک ایران, 777; 10(1): 47-60. گرادیان‌های افقی و قائم و صافی‌هایی که از ترکیب آن‌ها تولید می‌شوند (مانند سیگنال تحلیلی) از متداول‌ترین صافی‌ها برای برجسته‌سازی جزئیات موجود در داده‌های مغناطیس‌سنجی هستند. هنگامی که دامنه تغییرات شدت بی‌هنجاری‌ها در سرتاسر نقشه زیاد باشد، خروجی این صافی‌ها نیز به‌طور مشابه دارای بی‌هنجاری‌هایی با شدت‌های مختلف خواهد بود که هیچگونه تعادلی بین آن‌ها وجود ندارد. این مسئله باعث می‌شود تا بی‌هنجاری‌های کم‌شدت در میان بی‌هنجاری‌های با شدت بالاتر پنهان شوند. در این مقاله صافی‌هایی با خروجی متعادل معرفی می‌شود. این دو صافی شامل سیگنال تحلیلی متعادل و صافی انحنای پروفیل است. این صافی‌ها بر روی داده‌های مغناطیس‌سنجی زمینی معدن سنگ‌آهن سورک یزد و همچنین داده‌های مغناطیس هوایی کراتون ییلگران استرالیای غربی به کار برده شده است. کاربرد این صافی در محدوده معدن سنگ آهن سورک سبب تعیین توده زیرسطحی جدیدی شد که این موضوع با حفاری‌های اکتشافی نیز اثبات شده است. where, and . In this paper we demonstrated the application of these filters to synthetic magnetic data and as well as real magnetic data from Soork Iron mine and the aeromagnetic data from Yilgran Craton in Australia. Application of this filter to the magnetic data from Soork Iron ore lead to detection of a new hidden body which is proved by exploratory drilling. انصاری، ع.ح.، علمدار، ک.، و کامکار روحانی، ا.، 1391، تراس‌بندی در تفسیر داده‌های پتانسیل: مجله فیزیک زمین و فضا، 38(2)، 157-166. Ansari, A. H., and Alamdar, K., 2011, A new edge detection method based on the analytic signal of tilt angle (ASTA) for magnetic and gravity anomalies: Iranian Journal of Science and Technology, A2, 81-88. Blakely, R., 1995, Potential Theory in Gravity and Magnetic Applications: Cambridge University Press. Blumentritt, C. H., Marfurt, K. J., and Sullivan, E. C., 2006, Volume-based curvature computations illuminate fracture orientations — Early to midPaleozoic, Central Basin Platform, west Texas: Geophysics, 71(5), B159–B166. Cooper, G. R. J., 2009, Balancing images of potential-field data: Computers & Geosciences, 64, 17–20. perCoo G. R. J., and Cowan, D. R., 2008, Edge enhancement of potential-field data using normalized statistics: Geophysics, 73(3), H1–H4. Lahti, I., and Karinen, T., 2010, Tilt derivative multiscale edges of magnetic data: The Leading Edge, 29, 24–29. Li, X., 2006, Understanding 3D analytic signal amplitude: Geophysics, 71(2), B13–B16. Ma, G., and Du, X., 2012, An improved analytic signal technique for the depth and structural index from 2D magnetic anomaly data: Pure and Applied Geophysics, 169, 2193–2200. Miller, H. G., and Singh,V., 1994, Potential field tilt—A new concept for location of potential field sources: J. Applied Geophysics, 32, 213–217. Mitasova, H., and H. Jarosalav, 1993, Interpolation by regularized spline with tension: II—Application to terrain modeling and surface geometry analysis: Mathematical Geology, 25, 657-669. Moon, W. M., A. Ushah, V. Singh, and B. Bruce, 1988, Application of 2-D Hilbert transform in geophysical imaging with potential field data: IEEE Transactions on Geoscience and Remote Sensing, 26, 502-510. Nabighian, M. N., 1972, The analytical signal of 2D magnetic bodies with polygonal cross-section: Its properties and use for automated anomaly interpretation: Geophysics, 37, 507–517. Phillips, J. D., Hansen, R. O., and Blakely, R. J., 2007, The use of curvature in potential-field interpretation: Exploration Geophysics, 38, 111–119. Rajagopolan, S., and Milligan,P., 1995, Image enhancement of aeromagnetic data using automatic gain control: Exploration Geophysics, 25, 173–178. Salem, A., Williams, S., Fairhead, J. D., Ravat, D., and Smith, R., 2007, Tiltdepth method: A simple depth estimation method using first-order magnetic derivatives: The Leading Edge, 26, 1502–1505. Verduzco, B., Fairhead,J. D., Green, C. M., and MacKenzie, C., 2004, New insights into magnetic derivatives for structural mapping: The Leading Edge, 23, 116–119.